Does it make sense to bid high enough on search advertising to appear at the top of the page? It’s a question we’re often asked by clients who use us to manage their advertising on Google and Bing. Disappointingly, the answer is: “it depends”. But it’s worth understanding the reasons. Those companies using pay-per-click advertising to drive direct sales can of course just keep spending more and more money, so long as the cost-per-sale remains less than the profit. For the rest of us, we just have a fixed amount of money to invest in pay-per-click advertising, and little way of gauging financial effectiveness. So it’s more a question of understanding budgeting. The first thing to understand here is that the overall cost of pay-per-click advertising rises exponentially as you bid higher, although you get more clicks, of course. Let’s say that the advert at the bottom of the page is costing £1 per click, and the advert at the top of the page is costing £5. Let’s also say that the advert at the top is likely to get five times as many clicks. The result? In the same time that the low-bidding advertiser spends £1 for 1 click, the high bidder spends £25 for 5 clicks. Is this worth it? Well, it depends on how much a click is worth to you. That’s just for one search. Now we have to apply this across the hundreds or thousands of searches which might give us quality visitors. As you’d expect, some searches are much better value than others, and we need to start by finding these. The value will be a combination of relevance and cost – at one extreme is the lucky strike of a highly-relevant, frequently-searched-for search term which also happens to be cheap because nobody else is targeting it. At the other extreme are the less relevant, competitive search terms which provide a low proportion of quality visits but with each at a high cost. That said, for many companies the spend still represents good value way up the curve. 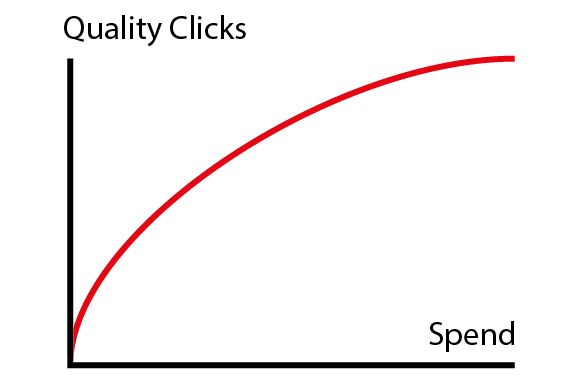 I always encourage pay-per-click advertisers to look at ‘quality website visits per £1000 spent’ when comparing media. It’s surprising how many think £50 for a quality website visit through search advertising seems expensive, but 10 decent website visits from a £1000 magazine advert is a reasonable return. In the graph above, for many advertisers the top might be tens or hundreds of thousands of pounds a month. Realistically, with a budget far smaller than this, they may never get beyond the first part of the curve. Effectively it will be a straight line – the more they spend, the more visits they buy, at almost a fixed cost per click. Getting the balance right between the bids on each search term and the number of search terms is very hard, especially when the spending has to meet a specific budget. It’s something you get a feel for after a while, but we’re always learning.